The collective members of the Communication Company fashioned themselves the publishing arm of the Diggers. As such, their record of broadsides, manifestos, leaflets and street sheets leaves us a rich slice of Digger philosophy as it played out on the streets of the Haight-Ashbury during the spring and summer months of 1967. Many of the anonymous sheets came from the Diggers themselves; others had been penned by Chester Anderson, one of the Beat survivors from North Beach who gravitated to the new scene in the Haight. Inspired by the Diggers and their Free philosophy, Chester and his partners Claude and Helene Hayward set up a printing operation with two "beautiful" Gestetner mimeograph machines that had been nefariously obtained through the offices of Ramparts magazine. Everything (or nearly so) was free of charge. If someone heard a rumor of a bust, or had a good lead on free food, or wanted to announce a poetry reading, the Communication Company had roving reporters on the street who could rush at a moment's notice back to the flat where the Gestetners were kept. Within a short time, a new street sheet would appear, distributed by the volunteers who used the street poles as their community bulletin board. I started collecting ComCo sheets, as we called them, in 1971. Chester once told me that he estimated there were around 900 unique sheets. To this day, I've collected around 350. My plan for these Web pages is to create a history of the Diggers out of the enormous archive of writings and publications they left behind. This collection of street sheets is a vital link to that history. I only hope they will bring as much pleasure to my audience as they have me over the years. Note on the format: I have used the catalog numbers that I assigned to the Digger and Communication Company materials as I collected them. Thus, the very first ComCo sheet that I collected is CC001. (It also happens to be the first ComCo sheet that was printed, as far as I know.) I have included a title for each item, although in many cases this is simply the first line of the broadside. Chester Anderson, along with Claude Hayward, founded the Communication Company after attending and being inspired by the 1967 New Year's Wail party that the Hells Angels had thrown for the Diggers in San Francisco's Panhandle Park. From January, 1967, until September, 1967, the Communication Company printed news and opinion and announcements and advertisements and poetry and editorials and artwork and pleas and screeds and everything else that caught Chester's eye. The equipment they used was unique for the time. The Gestetner company produced a duplicating machine that made its antecedent, the mimeograph, seem primitive in comparison. Over the span of nine months in 1967, the Communication Company output roughly 900 items. Most of these were 8-1/2" x 11" single sheets, occasionally printed on the reverse side, occasionally stapled together in leaflet format. 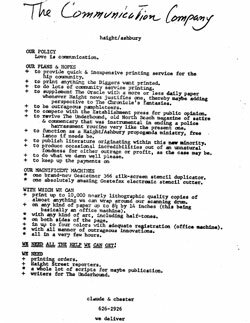 Communication Company volunteers distributed these broadsides in the Haight-Ashbury: stapled on bulletin boards, telephone polls, taped to doors and windows, handed out on the street. Thus the term "street sheets" which together present an important resource for understanding this point in time and space that was an epicenter of the Sixties Counterculture. The thesis examines the history of the Communication Company, a grassroots radical street press utilizing mimeograph technology and operating for and within the psychedelic hippie counterculture of San Francisco's Haight-Ashbury District from 1967-1968. The symbiotic relationship between the Communication Company and the Diggers, a street theater and anarchist collective that became a group of de facto social workers of the Haight, is discussed, demonstrating how the Communication Company fulfilled a critical role as the Diggers' outreach and information ministry. The products of the Com/co press were also examined within the context of the American radical pamphlet tradition. By exploring the cycle and activities of Com/co, the study sought to shed new light on the radical pamphlet tradition and the role it played in the 1960s counterculture. CC001. 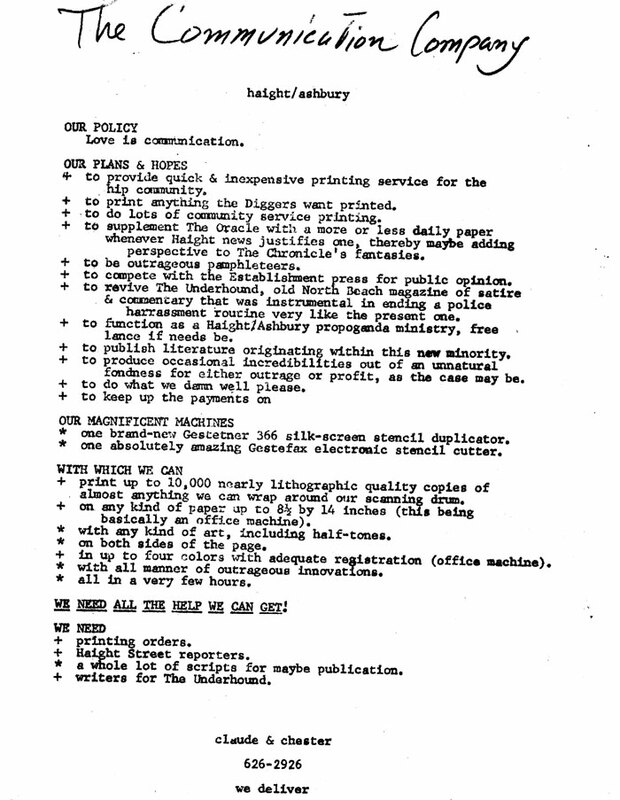 First announcement by Claude & Chester of their aims, hopes, and dreams for the Communication Company, proudly detailing "our magnificent machines" that they will use "to be outrageous pamphleteers" and "to print anything the Diggers want printed." Click on image to view a large version of the graphic scan.